My friend Sally and I are often partners in "Crime". Most of the "Crime" being a road trip to our favorite antique store about 25 miles south of here. The "Crime" always includes lunch and a stop at one or two or three flea markets in the area. But none equal Dapper's in Pittsburg for both price and selection of merchandise. 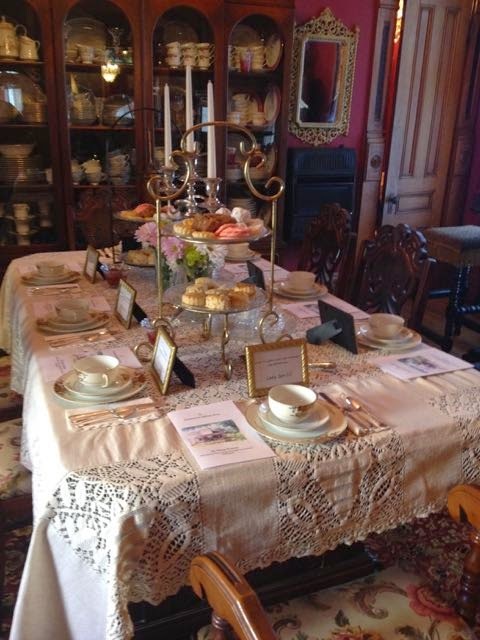 But this weekend, we were "Partners in Crime" when we hosted a Downton Abbey Tea at her beloved Victorian Home, Rose Haven. Not an ordinary tea, but a real English Afternoon Tea with tiny sandwiches, scones and jam and cream, and an array of sweets. And not two ladies in jeans and aprons pouring tea, but a full staff to serve our guests wishes. 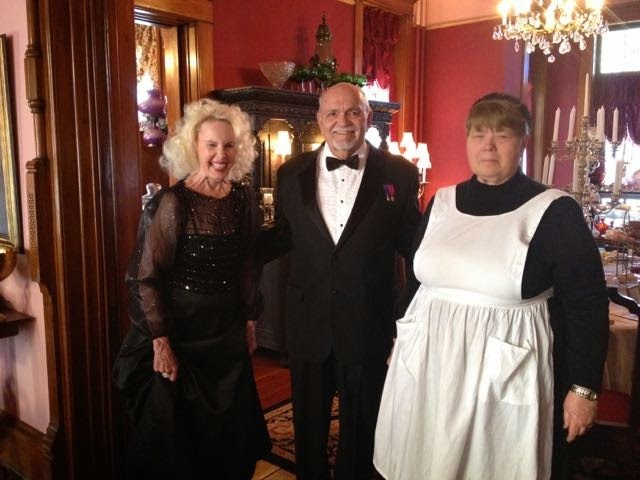 From the Butler who greeted the guests to the Dowager Countess herself to Mrs. Simkins, the beloved cook. 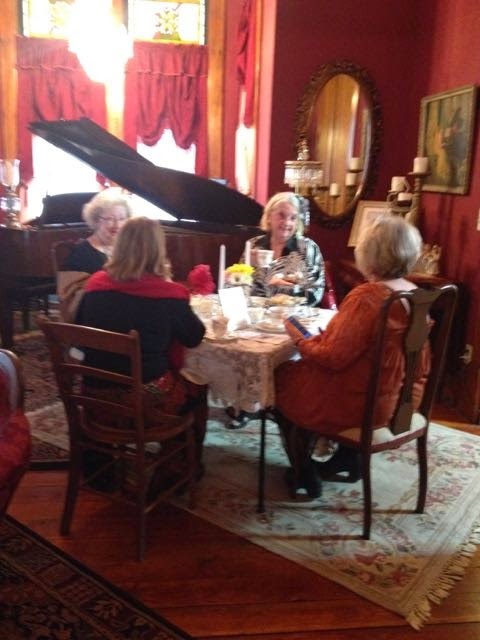 Sally's home makes the perfect setting for a Downton Abbey Tea. We had 21 guests and set up three tables in her lovely home . . . The biggest table, it held nine guests. Three curates were on the table holding scones and sweets. Sandwiches were on sandwich trays brought out at the last minute. 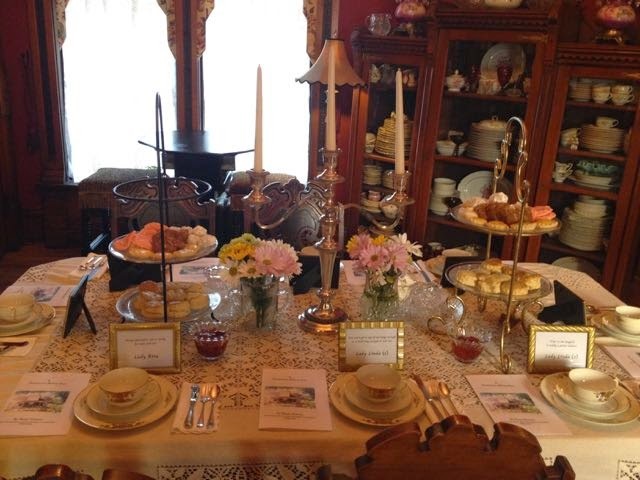 This table was set with Sally's wedding china. The "family" dining room. A smaller dining room which seats eight. 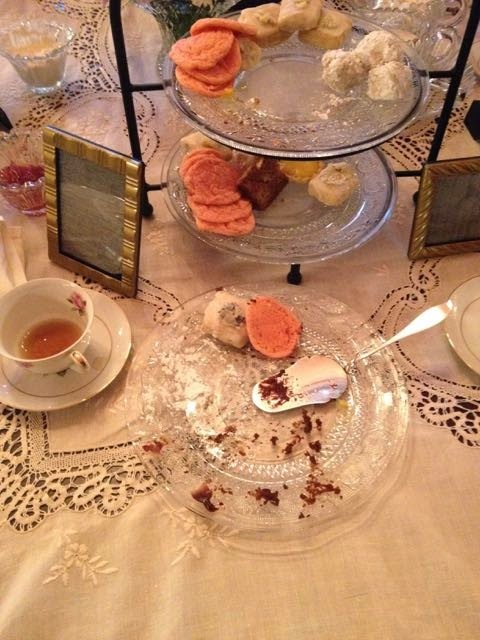 Two curates held sweets and scones and sandwich trays were brought in with the assorted crustless tea sandwiches. The china is an old Noritake pattern edged in gold. 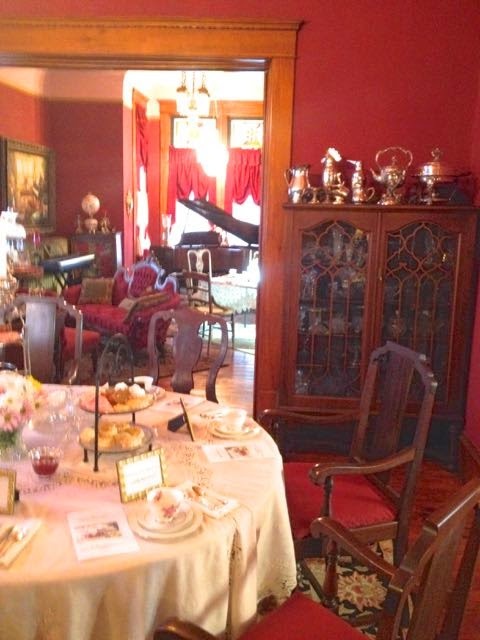 And lastly a table for four in the music room. Three sisters and a friend held sway at this table. The rowdiest of the bunch, we thought! Delicate china graced each place setting at this table. At each place was a framed placard identifying our guests as "Lady ("first name"). 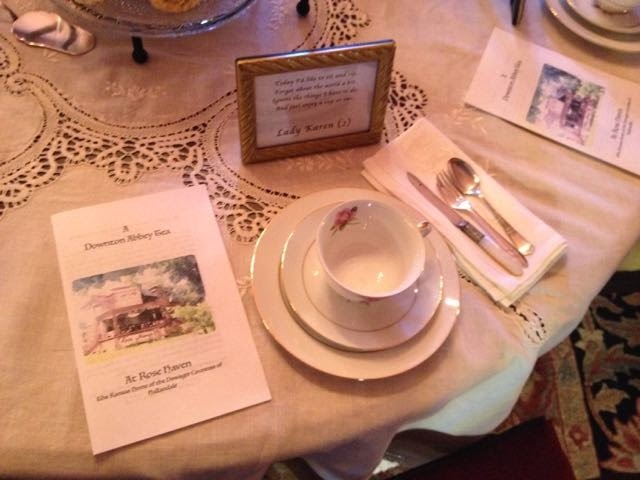 And each place had a handout telling the story of how The Dowager Countess came to live at Rose Haven with her beloved servant, Mrs. Simkins. 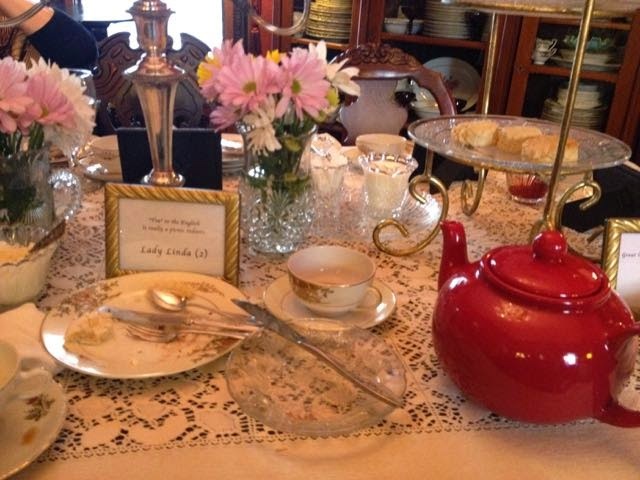 The tea food was all on the tables and Her Ladyship and I (for I was Mrs. Simkins) poured tea. Cups and cups and pots and pots of tea! When everything is in it's place and everything is perfect . . .
And I like pictures that tell a story . . . of good times had by all. Of tables empty, before the dishes are cleared. You just know that a good time was had by all! 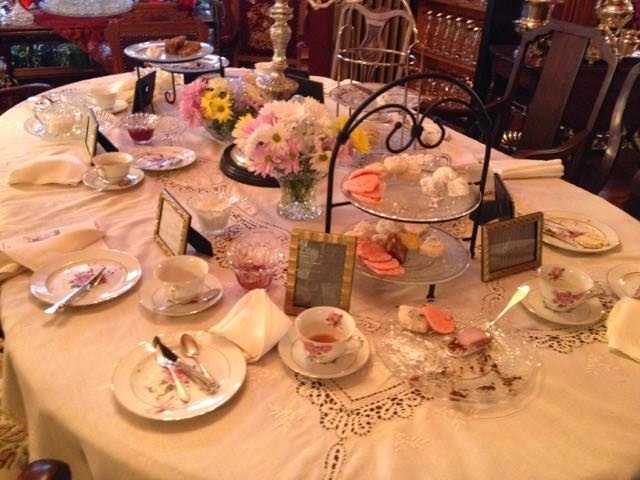 The sandwiches were eaten, the curates almost emptied of all the good things that one comes to expect at an afternoon tea. And we sat amidst the dishes, visiting, sipping, and remembering what a fun time was had by all! Will we do it again? 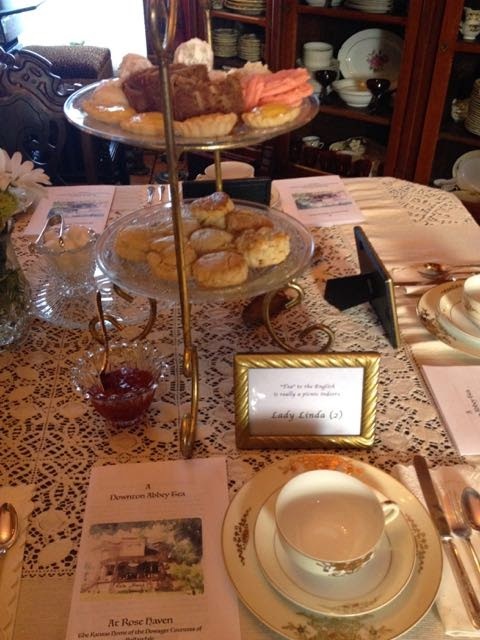 Next year, the Countess and Mrs. Simkins (and Calvin) will appear for another Downton Abbey tea . . . . and this May, we might, just might host a tea in honor of Queen Victoria's Birthday! 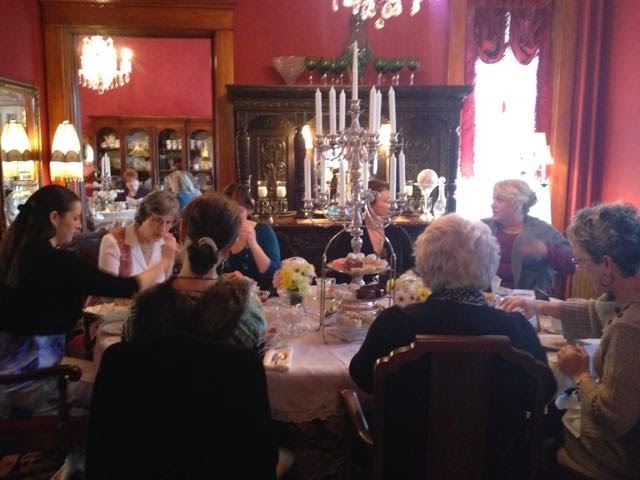 It is Tuesday and I'm sharing our Downton Abbey Tea with Sandi at Rose Chintz Cottage for Tea Time Tuesday and with Bernideen for Friends Sharing Tea. What a most special day for all the people who attended the Tea. Sounds like a lot of work for you. You made the tables look so beautiful. Love all the pictures you shared. Would have loved attending myself! What a wonderful event and such a huge success. Her home couldn't be more perfect for this tea time and I am sure the people who attended will be talking about this for weeks to come! So glad you shared. A lot of work yes, but I know how passionate you are for hosting events like this and it would have been memorable for all the guests. What a beautiful event. Thanks for sharing. Such a VERY special day. The tables were lovely and it must have been a wonderfully memorable event. WOW! What a fantastic tea. I'm impressed by your attention to detail. Martha, this was simply lovely and yes, a good time was had by all! 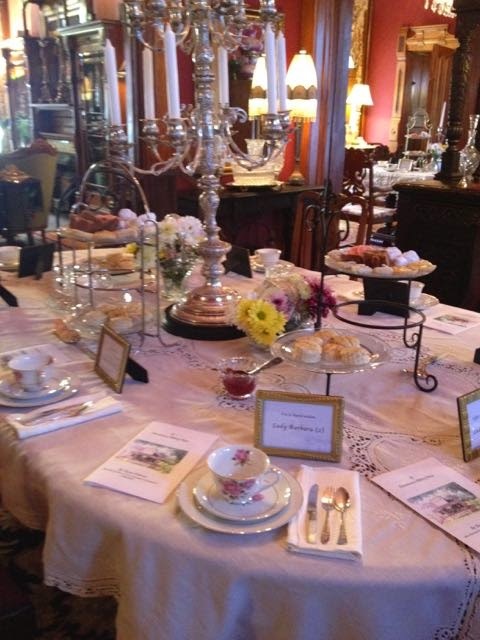 The linens, the curates laden with goodies, and the beautiful china made for a memorable tea time. I'm so glad you shared this splendid event with us. I thoroughly enjoyed it! And I know you were right in your element. How delightful this all looks, and what happiness you all must have shared together. 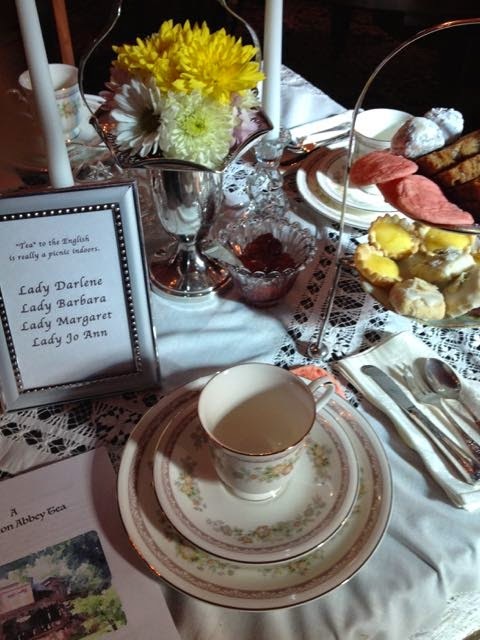 I'm sure there may be others in the US who are devoted to Downton and perhaps even hosting teas, but I doubt anyone could have done a better job at recreating the spirit of the Abbey. We have all been waiting with baited breath for this post. You did not disappoint us. How Delightful! All of your hard work was definitely worth it. Thank you so much for making the effort to share it with us. You all deserve to put your feet up and have a hot cuppa. Ohmygosh, Martha, what fun!!! And what a lot of work. :-) Gorgeous tables, settings, food -- and I would like that Mrs Simkins to come and organize my next 'do -- she looks very savvy and competent. Where did you get that costume? It is perfect. I've never heard tiered holders called "curates," that's so neat. I always learn something in addition to seeing GORGEOUS pictures at Linderhof! AND PS ... <3 and <3 and <3 and even more hearts and smiles for you. Oh to be a guest at that lovely tea party, Martha!! Everything looks so elegant and the food looks fabulous. I sure everyone that attended will be talking about this party for quite awhile. Your Downton Abbey Tea is elegant. It should be written about in Tea Time Magazine! Thank you so much for allowing us to attend vicariously. I love your imagination, Martha - and the fact that you bring it to life. ....and there I was congratulating myself on having managed a cup of tea and a biscuit while watching Downton on Sunday night! Loved it! Thank you for all the lovely pictures. Oh Martha, that looks like so much fun! Everything was set up so nicely and the food looks wonderful! How fun! How utterly delightful and quite simply perfect! 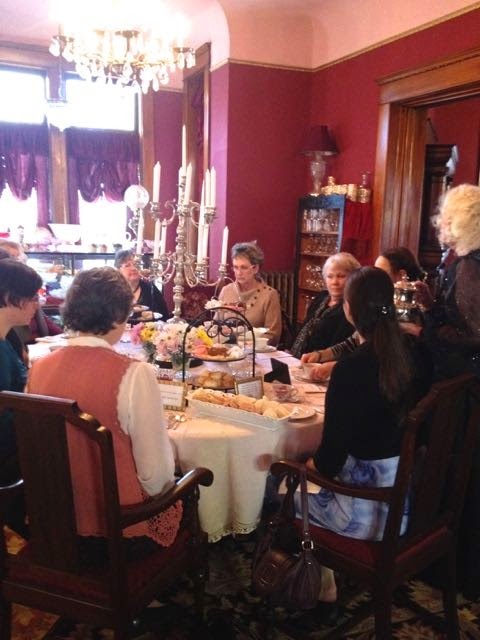 I adore that the three of you were "in character" for this Downton Abbey Tea at Rose Haven!!! 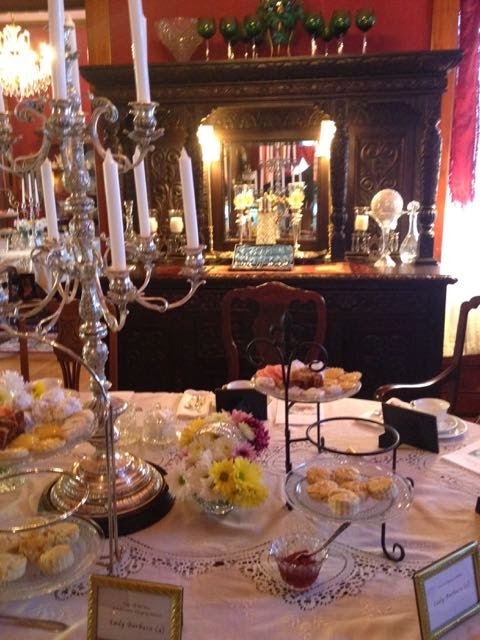 Every detail of those tables and treats was elegantly done, dear friend!!! How fabulous! 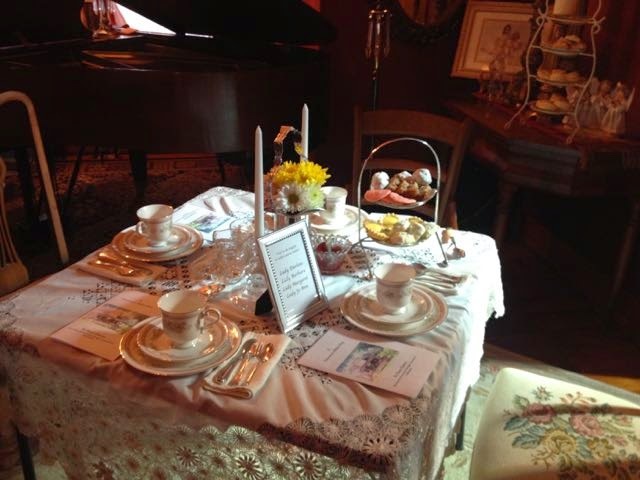 What a wonderful place and theme for tea! Wish I'd been there! Thanks for posting the lovely photos! What a beautiful home, decor, treats, table settings, and of course the warmth of the hosts. Simply beautiful!